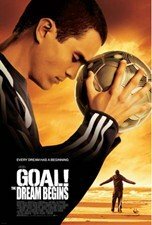 While living in Los Angeles, a young Mexican immigrant finds his world turned upside down when he is given the opportunity to travel to England and pursue his dream of becoming a professional soccer player. Suddenly thrust into an unfamiliar land where soccer is a way of life, he must prove that he has what it takes to overcome the odds and become a superstar on the field. Kuno Becker, Stephen Dillane, Anna Friel star. 118 min. Widescreen (Enhanced); Soundtracks: English Dolby Digital 5.1, French Dolby Digital 5.1, Spanish Dolby Digital 5.1; Subtitles: English (SDH), Spanish; audio commentary; featurettes; music video. In this sensational sequel to "Goal! The Dream Begins," professional soccer player Santiago continues to strive to make his dreams of sports superstardom come true. After he is traded from Newcastle United to Real Madrid, he struggles to adjust to playing with a new squad. Now, Santiago must overcome a series of obstacles in order to take his career to the next level. Kuno Becker, Anna Friel, Allesandro Nivola, and Rutger Hauer star. 115 min. Widescreen (Enhanced); Soundtrack: English Dolby Digital 5.1; Subtitles: Spanish; audio commentary; featurette; deleted scenes; theatrical trailer; bloopers.